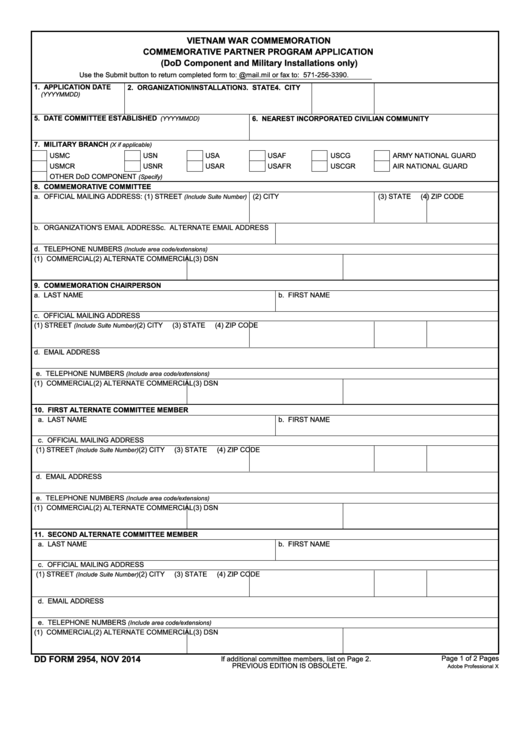 Download a blank fillable Dd Form 2954 - Vietnam War Commemoration Commemorative Partner Program Application in PDF format just by clicking the "DOWNLOAD PDF" button. Complete Dd Form 2954 - Vietnam War Commemoration Commemorative Partner Program Application with your personal data - all interactive fields are highlighted in places where you should type, access drop-down lists or select multiple-choice options. Use the Submit button to return completed form to: WHS.VNWAR50th_CPP_MILAPP@mail.mil or fax to: 571-256-3390.